There are breweries, microbreweries, and then there are nanobreweries. 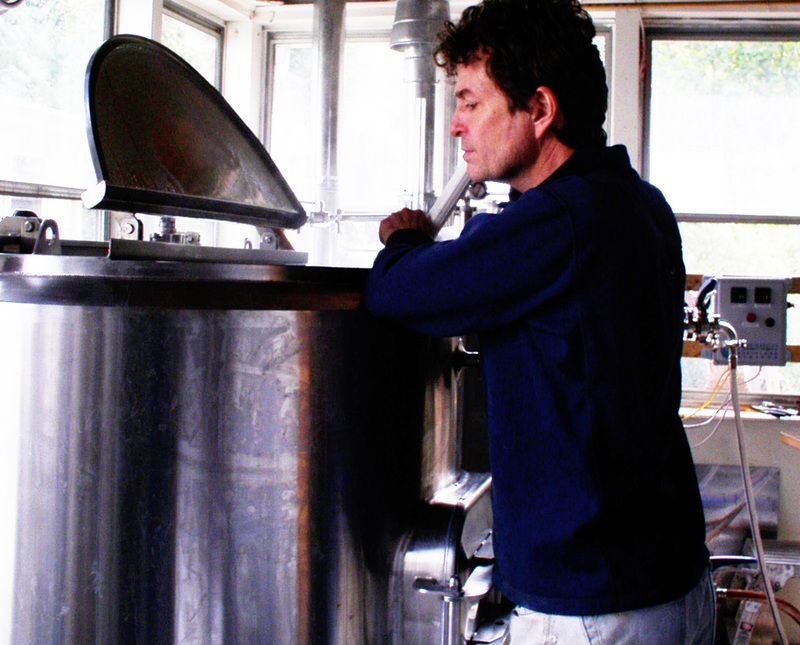 Blind Bat Brewery is brewer Paul Dlugokencky, a part-time, one-man operation based in Centerport, New York. While his batches are small, he brews many different varieties, including: Hellsmoke Porter, Old Walt Smoked Wit, Vlad the Inhaler, Long Island Potato Stout, Hell Gate Golden Ale and Mild-Mannered Ale. Seasonal summer beers include Beached Blonde and Harborfields HefeWeizen. Paul took time to answer some questions. Paul mashing in a batch of Hellsmoke Porter. You’re doing an amazing job with your beers. What got you started brewing? (Paul): Thank you, it was actually wine making that led me to brewing beer. My wife Regina and I made wine to give to our guests at our 2001 wedding. She noticed my interest in the brewing section of the wine & beer making supply store we were going to back then (Arbor Wine and Beermaking in Islip, New York) and she surprised me at Christmas with a beer making kit. I was hooked right away, and transitioned from extract to all grain to be able to play more with the possibilities. Your beer is very well-received by beer enthusiasts, bars, and restaurants. Has the demand overwhelmed you? I am very fortunate that folks have enjoyed what I’ve been putting out there so far, since I’m brewing what interests me. I’m brewing beers that I want to drink, rather than try and do any analysis of the market, etc. Some of the beers involve a bit extra work before I can get to brew day, but it’s about the journey as well as the end result. It has been difficult keeping up with demand. I wish I had more time to brew—the current part-time schedule of the brewery is frustrating, but I have to keep the old day job for now while I work on growing the business aspect of the brewery organically. You have an impressive line-up. Anything new on the horizon that you can tell DnU readers? In the works is what I hope will be a farm-and-garden series using a variety of local ingredients. I’ll tell more if the test batches turn out well. These would be rolled out throughout the year, as the local ingredients become available in their respective seasons. Have you had another brewer’s beer and thought, man, I wish I made that? Cocktail olive, maraschino cherry, fancy umbrella or lemon twist? Thanks, Paul! You’ve not only given us a behind-the-scenes look at the life of a passionate home-brewer who made the transition to regional distribution of his beer, but you also name-dropped our favorite Thelonious Monk song! Blind Bat is available in limited runs around Long Island, the Metropolitan area, and Westchester. We highly recommend seeking out any of Paul’s creations. Best of luck, Paul! I’ve heard nothing but good things about Blind Bat! Any idea where I can get some of Blind Bat’s beers? I GOTTA try the Long Island Potato Stout and the Hellsmoke Porter! I know Paul just sent out some of the Potato Stout, so better call your local, because it runs out quickly! Hey Paul, what would it take to quit your day job? help is just around the corner, all u need to do is ask!